The Infant & Toddler (IC/Nido) childcare program accommodates the young children from 2 months to age three. Children use a variety of materials specially designed for the Montessori classroom to assist in the important work of developing language, fine motor and gross motor skills. The toddlers also work extensively on social skills. 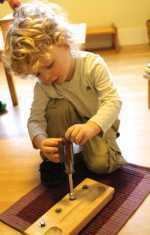 The Toddler childcare community provides a small group Montessori experience to the young child. Our classroom allows up to 12 students with one Montessori teacher and three assistants. In this childcare setting, the children come to feel the classroom is their own peaceful, special space where they play a meaningful role in their own care and the care of their environment. The classroom is carefully prepared to meet the unique needs of this age. All furniture is a size that allows maximum independence and the toddler materials are designed to be attractive and inviting to the child. Areas of learning include large muscle movement and fine motor exercises for hand-eye coordination. Practical Life exercises such as pouring, sweeping, dusting, buttoning, zipping and table setting are introduced early, providing opportunities for children to care for themselves and their environment. Lessons of grace and courtesy are practiced daily to help the children learn to be considerate of others and function successfully in a social setting. The adults in the Toddler childcare environment are the children’s models. They conduct themselves in the way they expect the children to conduct themselves. Children at this age learn not only through individual lessons and independent practice, but also through their attention to what the adults in their lives do. A strong teacher-parent relationship is essential to the success of the Toddler program. Daily informal communication, formal conferences and parent education are part of our ongoing commitment to enhance these relationships. The first three years of life are full of exuberant growth. Movement, language and personal independence mature more rapidly now than at any other time. A definition of the world as a safe place, in which one's unique self can flourish and find meaning, begins at this development stage. Our infant-toddler childcare community knows that each child is a special individual, full of potential. The child's experiences away from home are carefully constructed, children are nurtured and empowered. Classrooms are inviting; materials are appropriately stimulating. Movement is encouraged; meaningful, ordered activities satisfy developmental needs. Our trained Montessori staff uses richly expressive language to accompany every action to create an enviroment in which the children thrive. The staff to child ratio exceeds the state required 4:1 ratio by providing a 3:1 ratio. There are only three infants per day, with a maximum of twelve children in the classroom on any given day. Full Days - 7:30 - 5:30 820.00 528.00 369. PMCH exceeds the State Child Care Rules ratio by providing a 3:1 ratio in the infant community. You will need to complete a General Admission form as well as the additional forms attached below for enrollment.